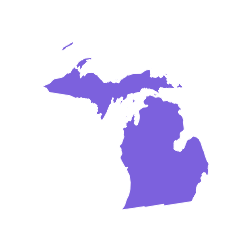 From Watersmeet, MI, take US 2 west approximately 3.5 miles to County Road 535, turn left onto County Road 535 and travel approximately 3.5 miles to the Sylvania Wilderness Recreation Area entrance on left. Access to the lake was easy, and the fact that tete are so few camp sites on the lake really makes it feel secluded. There are 2 nice beaches on either end, and easy portage to other lakes.